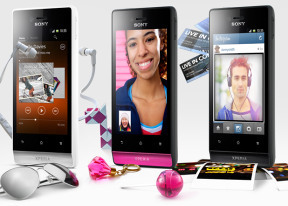 The Xperia miro comes with the new Sony gallery, called Album, which is now available on most Ice Cream Sandwich Xperia smartphones. It has a whole new interface where images are arranged into stacks of thumbnails and sorted by date. You can also opt to show all of your albums in one place. There are three tabs above the stacks - Pictures, Map and Online. Pictures is the main tab - you can use pinch gestures to make the thumbnails bigger or smaller. Map reminds us of the iOS gallery, where all pictures with a Geo-tag are shown on a map of the world. The Online tab uses pictures from the connected online services - Google Picasa, Facebook, etc. You have options to tag, like and comment on Facebook photos much like you did with the previous Xperia Gallery. Images in both galleries can be cropped or rotated. Quick sharing via Picasa, Email apps, Facebook, Bluetooth or MMS is also enabled. Sony has added a new video player as well. It's dubbed Movies and it too has a completely redesigned interface. It's connected to Gracenote, which helps you find additional information about the movies you have preloaded. Codec support is almost non-existent - you can play MP4 and 3GP files. DivX and XviD videos were a no go and so were AVI files. You can download a video player off the Google Play Store with support for more video codecs but chances of getting a video (one not shot with the phone itself) to play smoothly are pretty slim. Coming to complete the trio of redesigned Sony apps is the new Walkman music player. It retains all the functionality of the older music players but adds a little bit extra here and there. It is divided into Playing and My music panels. In the My music section, you can update your album art and music information like album, year, and more. SensMe is included, meaning you can filter your songs by type - upbeat, energetic, mellow, dance, etc. Creating playlists is enabled and you can also view your Facebook buddies' activity if they too use the Walkman player. Currently, the only available visualization is the album art. Finally, the Walkman player offers support for customizable equalizer settings, giving die-hard audiophiles the chance to fiddle around with the individual EQ bands. While the rest of the music player is the same as what we saw on Sony Ericsson handsets, this one adds music controls to the lockscreen. They replace the clock, which might be annoying if you just want to check the time. Still, the clock slides out of view, so you have about a second to see what time it is (or just look at the small clock in the upper right corner). The Sony Xperia miro is equipped with an FM radio, which has a neat and simple interface. It automatically scans the area for the available stations and places "notches" on the frequency dial for easier scrolling to the next station. There's a Force mono option to use in case of poor reception. Unfortunately, the Sony Xperia miro shares its audio-related internals with the Xperia tipo. This means that you'd be getting rather uninspiring output, and pretty low volume levels. 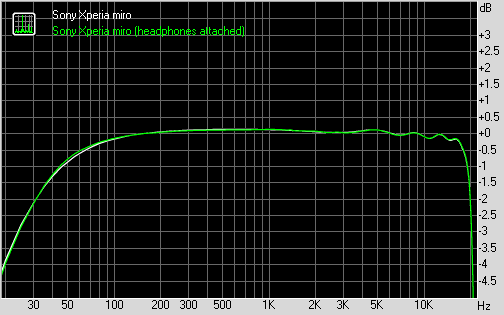 When connected to an active external amplifier the Xperia miro got only average scores, and imperfect frequency response. All this combined with the poor volume adds up to a mediocre overall performance. The good news is there's little degradation when headphones come into play. Stereo crosstalk rises only a little, but since it was quite high to begin with, you are only left with an average reading. The distortion levels remain under control and better than many other smartphones we have seen, but the rest of the readings are still only average and the volume levels leave lots to be desired.